A septoplasty is a surgery that’s performed to correct a deviated (crooked) septum. This wall of bone and cartilage divides your nasal passages into two nostrils, and when it’s severely crooked or off-center, it can cause problems such as nasal blockages and congestion, nasal discharge, and postnasal drip (the sensation of mucus dripping down the back of your throat). It can also cause snoring and sleep apnea, a serious sleep disorder that can be life-threatening. In this blog, the board-certified physicians at eos sleep explain more about what a septoplasty is and what you can expect from this type of surgery. What does a septoplasty consist of? This type of surgery is an outpatient procedure that doesn’t require your skin to be cut since it’s performed entirely through your nostrils. It usually takes from one to three hours to complete, and most patients can go home the same day. Your surgeon will make an incision inside your nostril and lift up the tissue that covers the septum in order to clearly view the bone and cartilage. The deviated portions are reshaped or removed, but enough of your septum will be preserved to maintain the shape of your nose. The tissue lining is then laid back down, and incisions are used to stitch the area closed. Soft splints may sometimes be placed inside your nose to help ensure that your septum heals straight and to minimize the formation of scar tissue. After your septoplasty, your doctor will let you know if you have splints and how long they’ll need to stay in place. Your stitches will dissolve on their own. 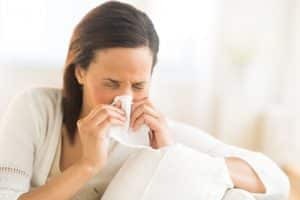 You’ll also be asked to avoid blowing your nose and heavy lifting for at least 10 days, and also to stop using aspirin, non-steroidal anti-inflammatory medications (NSAIDs), and steroid nasal sprays for two weeks after surgery. You might experience some post-surgery symptoms such as nasal stuffiness, which usually improves after a week. Some people may experience mild pain and pressure, which can usually be relieved by extra-strength Tylenol. Everyone is different, but you also may feel tired for about a week after your surgery. Nasal saline sprays can help keep your nose comfortable after surgery. These over-the-counter sprays can be used every few hours. Sinus irritations (such as those performed with a neti pot) may also need to be performed to help clean debris from your sinuses, and they’ll probably need to be done at least twice a day. If you snore or have sleep apnea, nasal congestion, or postnasal drip, contact the doctors at eos sleep today for an evaluation. We’ll get the information we need to correctly diagnose the cause of your issues, and if needed, can perform a septoplasty to provide long-term relief that helps you breathe easier.